I feel the need to weigh in on a topic that has been in the news lately. But perhaps not the one you're thinking of. We need to talk a LOT about where it's appropriate to use the bathroom. Specifically - we need to talk about where it's NOT appropriate to use the bathroom. And by that I mean, THE DRESSING ROOM OF LARGE RETAIL CLOTHING ESTABLISHMENTS, TARGET INCLUDED. Who are all these people who are rampantly peeing or letting their children pee in dressing rooms in America? Don't even pretend like you've never smelled pee in a dressing room either - I am not having any of your denial. It even smells like pee in the Stein Mart dressing rooms, and those are way fancier than Target. If there's something America should be focusing on right now (aside from the shortage of decent limes) it's the problem of pee-soaked dressing room carpet. I call on our lawmakers to pass an across-the-board, equal-opportunity, pan-gender, pan-racial, all-inclusive death penalty on dressing room pee perps immediately. Just put everyone to death on their first offense. That's what we call a deterrent down here in the Lone Star State. Then all of us can feel safe again when we are trying on overpriced clothes from China with scratchy tags that give you the hives. It is necessary for us to move ahead as a unified people. Glad to have that off my chest. It's been bothering me since the mid-70s. Today I'm hosting the MIX-Ability challenge at Splitcoast, and since it's just been raining non-stop here since like the 1400's, I picked an April showers bring May flowers theme. 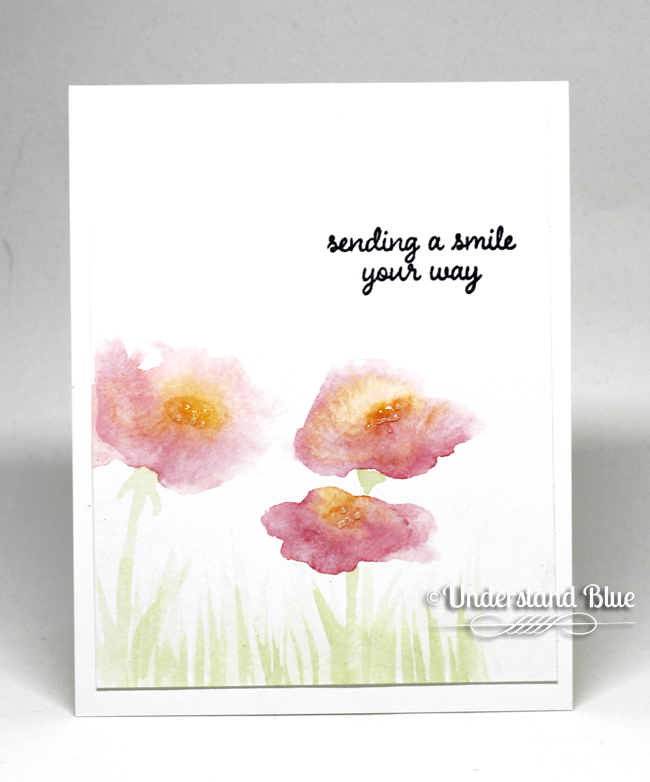 If you play along in the challenge, you need to create free-form, not stamped, watercolor flowers. No-line coloring is not allowed. It needs to just be you, some water and some pigment. I can hear people crying all over America, but look how fun they are! For mine, I just put down blobs of water, not trying to paint a flower shape at all, and then touched three colors of Mission Gold watercolor to the blobs and let the colors spread on their own. I painted these on Strathmore Ready-Cut watercolor cards. I let them dry naturally, and then added a stamped sentiment from the Love and Affection stamp set, which you will see in the new catalog, and added my new favorite obsession to the center of the flower - Nuvo Drops - along with some clear Wink of Stella. Nuvo Drops are sort of like Stickles, or Dazzling Details, but a different consistency. They dry faster and you can make your own enamel dots with them. Very fun and a huge array of colors - the turquoise is gorgeous! The color I used here is White Blizzard. So to prove to you that you can create free-form flowers in under four minutes, here's a real-time video to prove it. This quick technique leaves you tons of time to go round up the dressing room peeers, so off you go now. Don't know if I love your rants or your art more! Love both for sure! One, I agree and have wondered the same thing. I love the Lone Star State for being no second chances much better than CA babying everyone. Great post and video! Thank you. I am going to try this. Love this look. Thanks for the video. I may just challenge myself to attempt this. Also thanks for that excellent video! This is really beautiful Lydia. I am trying to learn to water colour so I pinned this to try. (It 'looks' like something I should be able to do but I have control issues...LOL BUT, I'll try! Love your card! Love how you make us laugh by telling us like it is! Love your rants because they're relatable. I'm breaking out the Mission Golds and trying this technique over the weekend. I'm new to watercoloring so I hope my flowers turn out 1/4 as well as yours. Wow, I had no idea and glad I have not experienced this. But still, you post was hilarious. And....I love your card! Thanks for the enabling of all these new products! I worked in retail for 20 + years at one of the Big Box stores. And I am here to tell you that they did more than pee in the dressings rooms. SOOOO GROSS! I actually saw a lady take down her childs pants and have her pee by one of the pillars out in the MALL! (In front of our store). I called security but little they can do by the time they got their they were long gone and just the mess left. I live in CA and we have people from all over the world that have settled here. Many do not speak English. Many people tried on clothes in the aisles instead of the dressing room. And then threw what they tried on, onto the floor. OH the stories I could tell. It is also one reason I will never work in retail again. I am over political correctness... OKAY that is my rant for the day, but you really struck a note in my songbook when I read your post today. On a more positive note... your card is awesome. Thank you for sharing your talent and instruction with us all! What a gorgeous card! I'm not brave enough to try watercoloring on a freeform level yet. Still mastering the basics. Is there anything people won't do? LOVE your card. Subtle, then it reaches out and grabs you. Absolutely love it. What a beautiful card. The colors are so soft and dreamy. Lydia, I have never smelled anything like you describe in a dressing room! I must say that I do most of my clothes shopping (like most of my other shopping) online and now I have a new reason to continue doing so! Thanks to you, I own Inktense Pencils and Mission Gold watercolors and a bunch of other things I can't remember right now. I might need to add these Nuvo Glitter Drops, but they aren't PRIME shipping on Amazon! And the shipping is as much as the item! Greetings, Lydia! I just love your work . . . mostly to look at as I'm intimidated by art! I would love to win the Mini Misti! You have so sold me on this item! My oldest stamp set is Lovely As A Tree . . . box says 2001, which is older than I've been a demo . . . 17 years in April! Love you, my friend! Wow, that came out just gorgeous. Wow. . .this may well be my favorite tutorial EVER! 1. because I LOVE watercolors, 2. because it's beautiful, 3. because it pushes me out of my comfort zone, and 4. because it was so easy (well, after a little trial and error and a couple of trashes). :) Thank you SO MUCH for doing this video!